There are a variety of names that have been used to describe Feline Lower Urinary Tract Disease (FLUTD) in recent years. FLUTED is now most commonly called "Feline Idiopathic Cystitis" or "FIC". "Cystitis" is a general term used to describe inflammation of the bladder. "Idiopathic" means the cause is unknown. FIC affects the cat's bladder and sometimes the urethra. FIC is a serious disease. Prolonged squatting or straining (while in or out of the litter box) and not producing urine or only a small amount (not to be confused with the signs of constipation). Many times these symptoms seem to resolve themselves within a week on their own, but will often recur. Idiopathic Cystitis is most often seen in cats that are less than 10 years old. In cats that are over 10 years of age, the above symptoms are usually associated with other conditions (i.e., kidney disease, urinary tract infections, bladder stones). Proper diagnoses is key to the successful treatment or management of this disease. What Causes The Symptoms of Feline Idiopathic Cystitis (FIC)? Normally the lining of the bladder protects the underlying tissues from the urine. In FIC, it is believed the inside of the bladder changes and becomes more porous and the protective lining of the bladder is lost or decreased. The bladder then becomes thicker, cells associated with inflammation accumulate and pinpoint hemorrhages can occur and oftentimes causes pain for the cat. changes in the routine (i.e., cat is no longer allowed outside when it had been before, the owner no longer plays with cat, etc.). adding small amounts of unsalted broth or water from a tuna can (not the oil nor the tuna) to the drinking water. If your cat enjoys canned food, you may want to increase the amount of canned food fed while slowly decreasing the amount of dry food. Canned cat food is high in moisture content (usually over 75%). I feed both dry kibble and canned food. However, I add LOTS of water to the canned food to where it looks like flavored water. This is my sneaky way to get more moisture into my cats' diet. How is Feline Idiopathic Cystitis (FIC) Diagnosed? FIC is diagnosed only by eliminating other diseases that could be causing the symptoms. Some cats can develop microscopic crystals in their urine. In a male cat, these crystals can block his urethra preventing him from urinating even though the bladder is full. It is an emergency if a male cat has a blocked urethra as this is a fatal condition if not treated rapidly. Get in to your veterinarian's office immediately. It is essential that you take your cat to the veterinarian if you suspect FIC (or any type of bladder or urinary infection). The veterinarian will perform a physical exam on the cat and may find the bladder either small and thickened or very large and distended. During the examination, the veterinarian will press on the bladder (called 'expressing' the bladder) to see if the cat is able to urinate or if the urethra is blocked. Through these examinations, the veterinarian may also be able to feel any bladder stones. A urine sample will be collected to perform a 'urinalysis' that will indicate if there are crystals, bacteria, blood, or white blood cells in the urine, the urine pH and also how concentrated the urine is. A urine culture may be performed to identify any urinary tract infections. The veterinarian may also take X-rays to look for stones, tumors, or congenital abnormalities. The veterinarian may also do a blood workup to rule out kidney disease or other disorders. The two main goals of treatment are to relieve stress and provide pain relief and decrease the concentration of the urine (by getting the cat to consume more water). Keep to your and your cat's normal routine as much as possible. If possible, do not change the diet and feed in a quiet location. Provide toys, window perches, scratching posts and other items to prevent boredom and encourage instinctual behavior such as stalking and pouncing. Locate litter boxes in a quiet location. Use large litter boxes. Most cats prefer clumpable litter. It is recommended to have one more litter box than the number of cats in the household (eg., if you have two cats, have three litter boxes). Increase the time you spend with your cat through play, grooming, etc. which reduces stress. Reduce any conflict between other pets or humans and the cat. Provide sufficient space for the cat. The more room the better. NOTE: don't forget that most cats like to be up high. 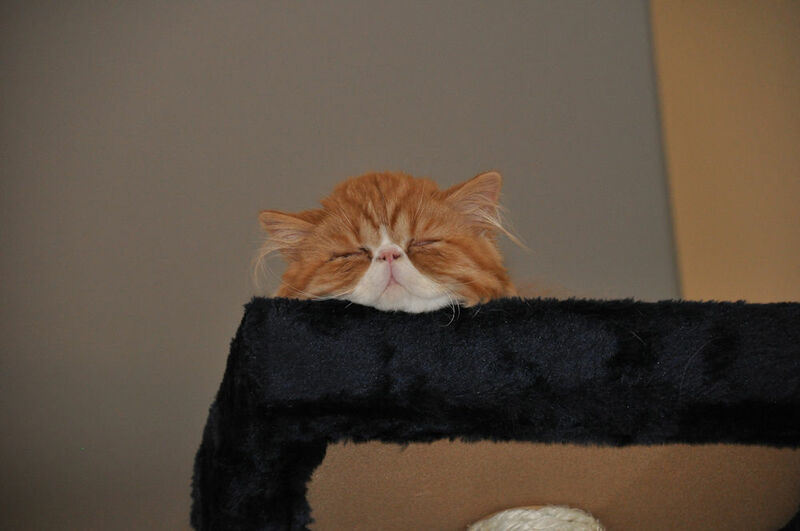 Consider using a cat pheromone product such as Feliway as pheromones have a calming effect on cats. Your veterinarian may prescribe a pain reliever and also possibly a tranquilizer to help your cat be more comfortable. Cystitis is a very painful condition and pain relief is an important way to reduce stress. Prognosis for Cats with Idiopathic Cystitis/FLUTD? Symptoms will often resolve within a week, but the disease tends to recur. By keeping stress low and increasing the water/moisture in your cat's diet (including feeding a canned food only diet, adding water to canned food, adding water to dry kibble, etc. ), you may be able to decrease the risk of your cat having further episodes. There is absolutely no evidence that early spay/neuter has any causal relationship with FIC. The early spay/neuter program has been going on for over 35 years in shelters on cats and dogs that are only eight weeks of age. Furthermore, please notice the use of "believe" in a few places of this article and the fact that proper diagnoses of FIC is only through eliminating other problems and issues.